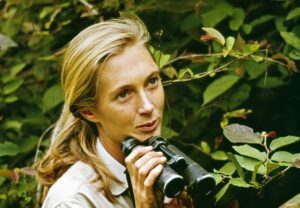 The film is a biographical documentary about the life of primatologist and conservationist Jane Goodall starting from 1960 until present day. You’ll view never-before-seen footage that has been tucked away in the National Geographic archives for over 50 years. 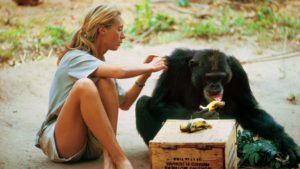 Writer/director Brett Morgen tells the story of a woman whose chimpanzee research challenged the male-dominated scientific consensus of her time and changed our understanding of the natural world. We witness Goodall as gradually coexists in the animal world of the chimpanzee community. She’s excruciatingly patient, offering smiles, an outreach of her hand or a slight petting of fur while the chimps study her. Her detailed drawings, notes, schedules-all provide valuable, insightful information to the scientific world. Here’s a family-friendly winner of a film for all ages to enjoy! It won the Broadcast Film Critic’s Choice Award for Best Documentary and should be nominated for an Oscar for Best Documentary. You can’t help but love this heartfelt film of her dedication to animals and all of the world.